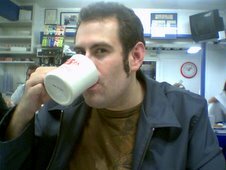 Dinerwood: Los Angeles Diner Reviews: Joanne's Cafe - Slashing Prices! Joanne's Cafe - Slashing Prices! 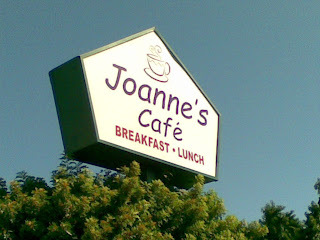 Once again out in the wilds East of Los Angeles, I accidentally stumbled onto Joanne's Cafe. It was clearly an old building with a newer restaurant inside--the classic A-frame building with a vinyl banner for a sign is always a tell-tale sign. After doing a bit of research, I discovered that it was once a pie place...perhaps even a member of the House of Pies family of restaurants. Inside, I was shocked at the odd pastels and spring time colors that decorated the interior. It was almost off-putting with its cheeriness. It reminded me of when I was a kid and my local McDonalds switched to a southwest deserty theme. I wanted the Hamburgular and Grimace, not taupe and turquoise paintings on the wall. 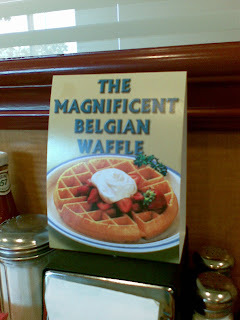 Now I have to say, I am Grade-A *over* the shameless advertising that the Belgian Waffle receives at every breakfast joint nowadays. The Belgian waffle is the Miley Cyrus of breakfasts. Who pays for these ads? It's fascinating to me. Is it Belgium? Is it the NWA (National Waffle Assosciation)? Is there a National Waffle Association? If not, why not? I was seated near the back of the restaurant by the emergency exit. An old couple waved good-bye to the front counter and exited through said emergency exit, which struck me as a little odd. A little while later, another elderly couple went out the same way. There didn't really seem to be a reason for it, as the front entrance and the emergency exit both emptied into the parking lot. My theory: old people don't give a ****. So the first thing you are going to notice when you look at the menu are the prices. Seriously, these are probably the lowest menu prices that I've ever seen at a restaurant where not only is there a waitress but an actual roof on the building. The average meal price is five dollars, and there is nothing over ten dollars. 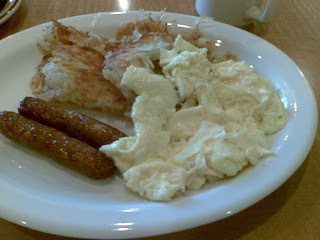 I ordered about as standard a breakfast as I could imagine: hash browns, eggs, and sausage breakfast. For my choice of bread, I ordered the zucchini bread. Not a normal offering for a breakfast bread, but if they have that as a choice, it must be something they are proud of. My food came out super fast. Like scary fast. After taking my first bite, it became clear that it was not efficiency that brought my food to me. My eggs were undercooked and my hash browns were mushy. 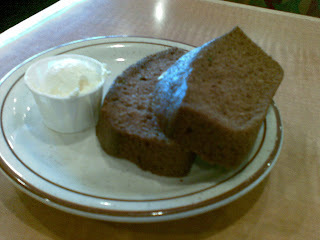 The zucchini bread was soft and warm and quite good. However, I would never say "You gotta try the zucchini bread." If you ordered it, I'd say "Oh yeah, it's good." It just didn't stand out as wonderful. Halfway through my meal, my stomach started to rebel. I couldn't finish. Now I will say that the sandwiches I saw on other people's tables all looked really good, so maybe the sandwiches are the way to go at Joanne's. On my way out, I had to stop at the fish tank. 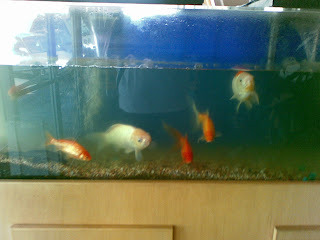 I like fish tanks at two kinds of restaurants: Chinese restaurants and restaurants I don't go to. 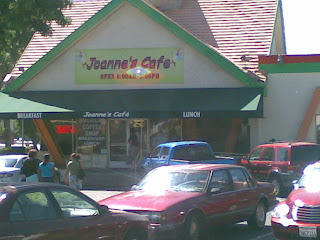 Joanne's Cafe is the kind of place you go knowing it won't be anything more than "good enough," and at those prices I can see why people would be willing to go, despite the low-quality. Only YOU can join the National Waffle Association! The old people should have been your first clue that it was a cheap place. Old people will literally eat anything if it costs $5. ANYTHING. so glad i was able to read a review before going. i love to try little mom and pop cafes and was thinking about going with my hubby after a movie. we are very short on funds and i want the place we spend our money at to be well worth it. we have decided not to go at this time as you described to food as not that great. (i am pregnant and would not like to end up with food poisoning on top of morning sickness) thank you for your honesty. Stevie Dee's Cafe - Shake the Shack.